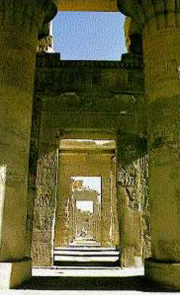 Edfu was the Greek city of Apollinopolis Magna, and is a religious and commercial center. Located about 33 miles south of Isna and 65 miles north of Aswan, this is a friendly town which produces surgar and pottery. It is also a hub of a road network. 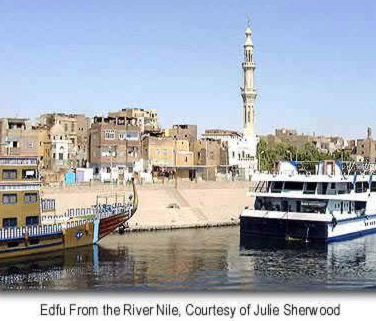 It was the capital of the second nome (Horus) of Upper Egypt. The main attraction here is the Temple of Horus, which is considered by most to be the best preserved cult temple in Egypt, but there is a mound of rubble to the west of the Temple which is probably the original old city of Djeba. The town was known as Tbot by the early Egyptians, by the Greeks as Apollinopolis Magna and by Atbo during Coptic times. 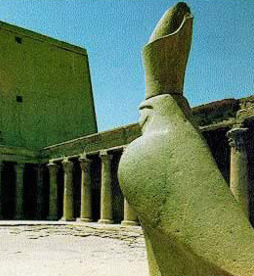 It was the capital of the second nome (Horus) of Upper Egypt.French and Polish teams have excavated some of the ancient city, finding Old Kingdom mastabas and Byzantine house.